This is a graph made with the use of the highly recommend computer program Encyclopedia Encarta. The internet is hard to carry in my backpack. 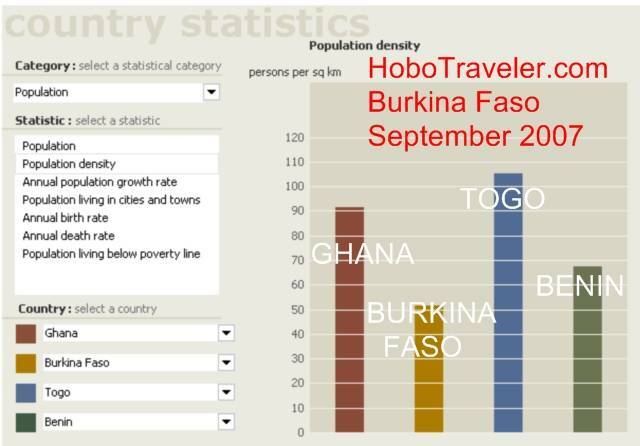 Where did all the people go, this is nice, Burkina Faso is less, there are less people in Burkina Faso than in Ghana, however here below Ouaga seems to be a bread basket. All that glitters is not gold and do not believe anything your read or hear. The statistics above are a guide, there are less people in these countries, pending a census, pending the Germans coming to count, and pending who is queue for my tax dollars donations. The reasons are out of control on why a country will distort statistics, but the distortion of truth is big business when some silly country will give you millions if you have AIDS. Burkina Faso appears in the belt way below the capital of Ouagadougou, Burkina south to the Ghana border to be small cluster populated. A few people here, a few people there, however they do not seem to be bunching in the cities or along the roadways like Ghana. Trendy, being a Farmer in Ghana maybe is not trendy, however being a Farmer in Burkina Faso still may be acceptable form of job. Education of people for jobs that do not exist, is encouraging people to leave the farm, and go to the city to be unemployed. Self-sustaining farming or what is negatively called subsistence farming can supply close to 95 percent employment, while Africa city life has beer, music and strife all packaged in a dream. Where are the normal black spots? 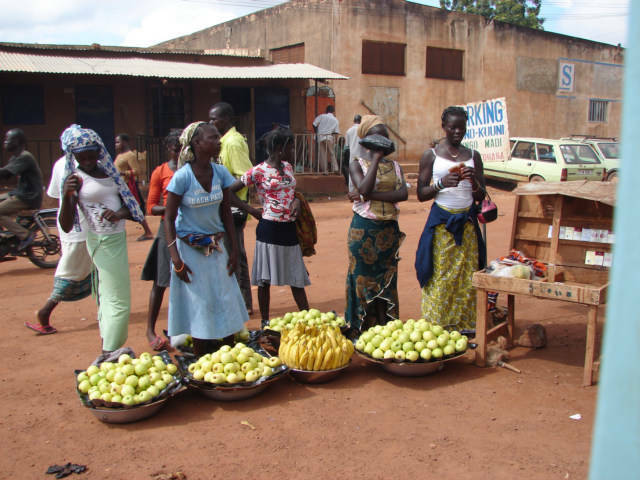 These Apples and Banana vendors outside the Rakieta Bus Station in Ouaga were selling beautiful fruits with friendly smiles. I want to thank all the great Farmers of Burkina Faso or wherever for this sudden increase in Beautiful Fruit. My daily intake of Apples and Bananas had tripled. The vegetables available here in the Po, Burkina Faso market is maybe the reason for the bright eyed children in the village. I found a few new vegetables. One lady quit the yams and had some potatoes. 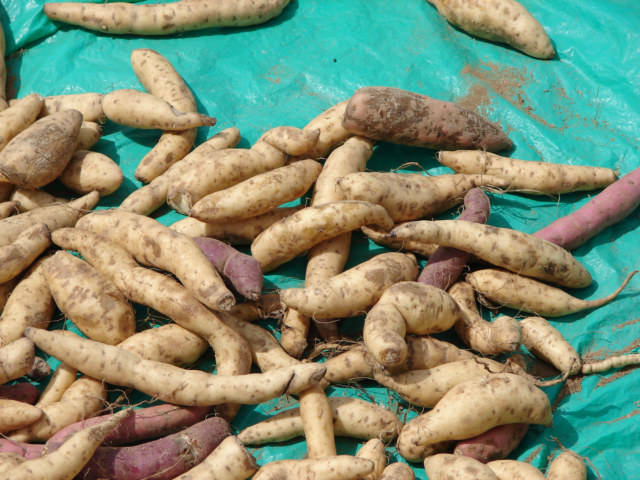 She was cooking French Fries using sweet potatoes, and tomorrow she promised me normal potatoes if you call these long thin version of potatoes normal.